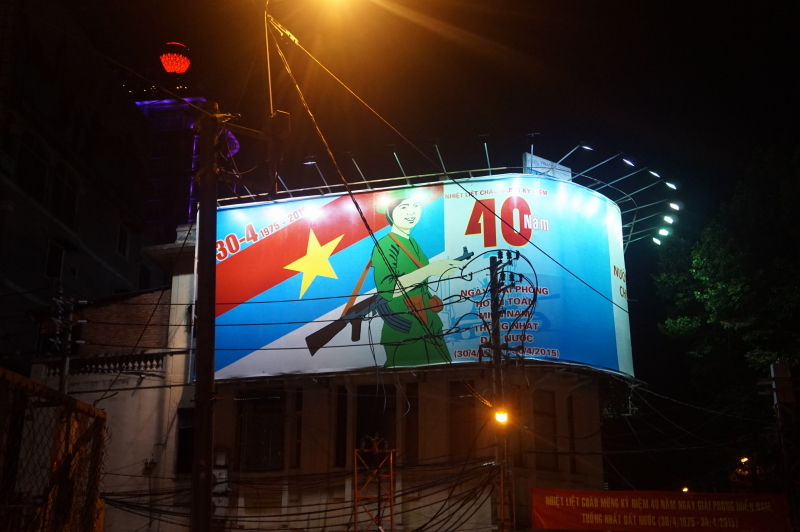 Delving into Vietnam | Hello Cool World! 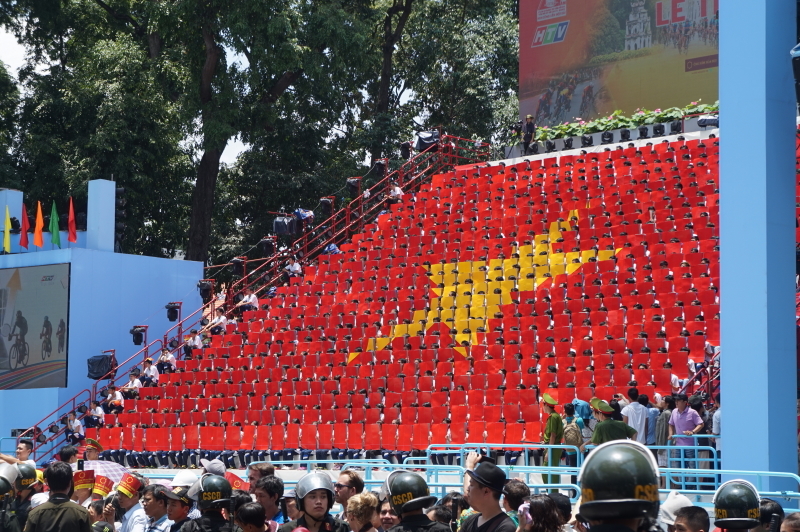 The war is everywhere in Vietnam, even though it ended 40 years ago. The references are everywhere, from the propaganda to the souvenir T-shirts. Crossing from Cambodia to Vietnam was a relatively painless experience. 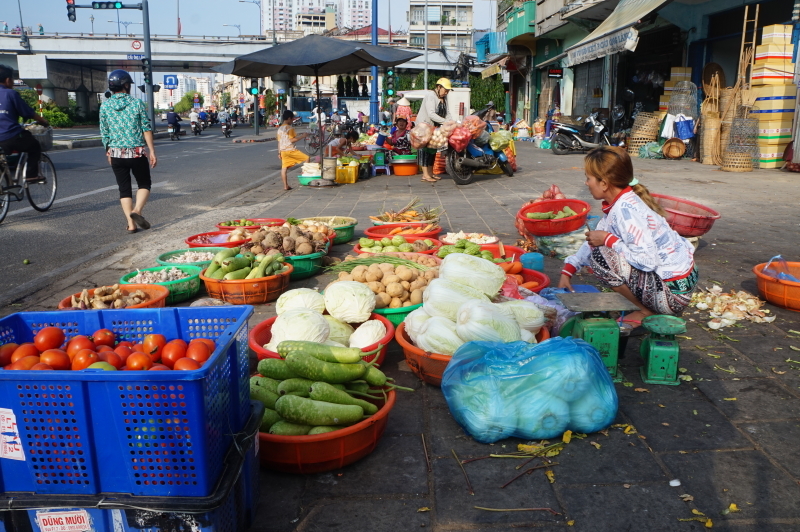 Unlike the Thai-Cambodian border, there was no one hustling us nor were there any shops or sellers lining the strip. We took a local, non-tourist bus and so there was no one on board to explain the process. Instead, we just followed along and handed over our passports when asked. A little while later, the bus stopped and we all got off; we walked a few metres while the bus rolled forward, and then got back on. After driving a few hundred metres, we got back off the bus, went into the customs building, and retrieved our passports. Truly simple. 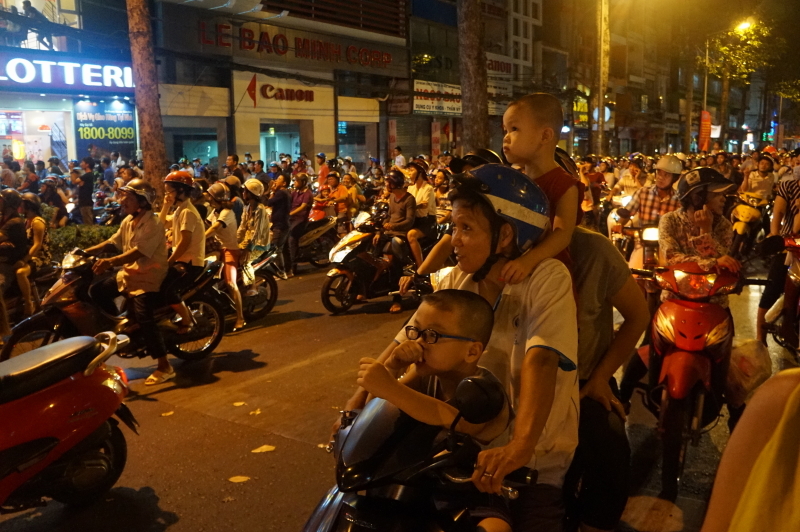 Several hours later, we found ourselves in the middle of motorbike chaos – we had arrived in Ho Chi Minh City or, unofficially, Saigon. 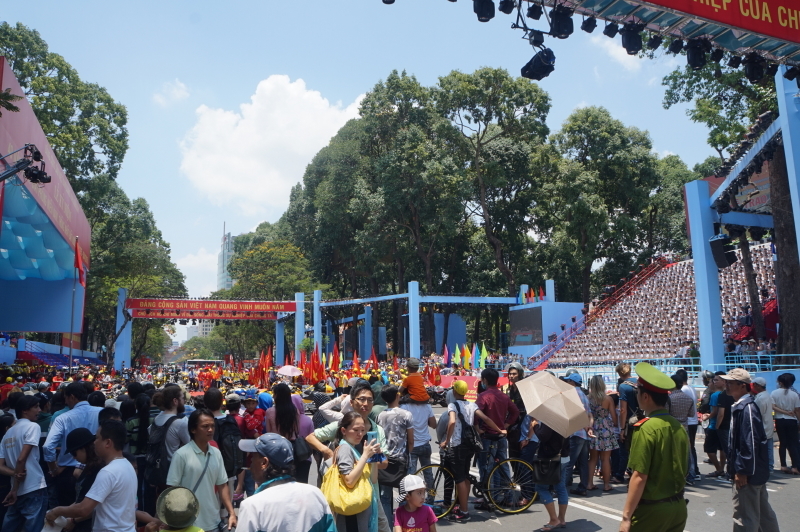 Unbeknownst to us, we had arrived on the eve of the 40th anniversary of the fall of Saigon; the day that North Vietnamese forces entered the city and took over the Presidential Palace. We heard that a parade would be held to celebrate the occasion, but by the time we figured out where it would be, it was largely over. I mean, we are not accustomed to parades starting at 7:00 a.m.!! 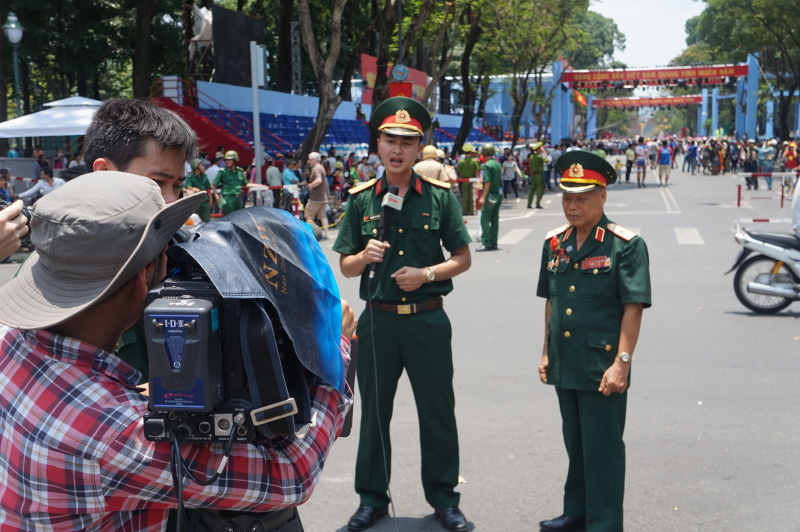 We poked around a bit and watched some of the televised show that was running all day, including the end of a bicycle race. Where the action is. 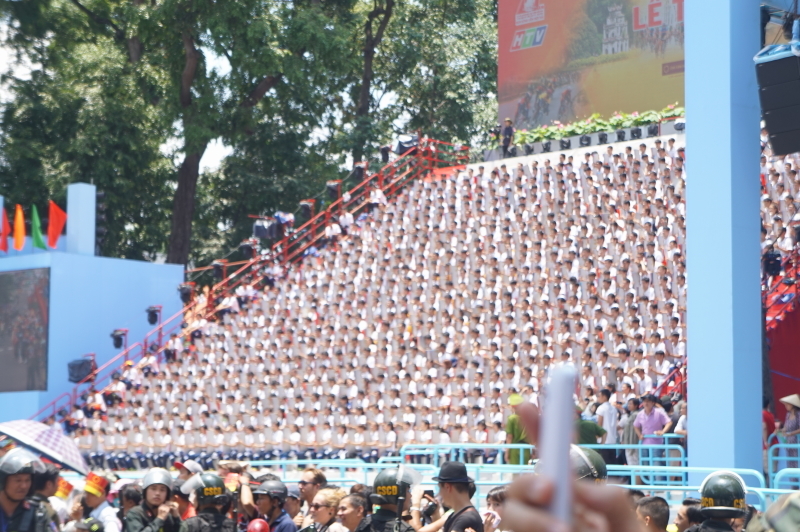 All events were staged in this small area, with an audience of dignitaries on one side and a stand of kids with coloured signs on the other. A pretty small event, broadcast nationwide all day long. 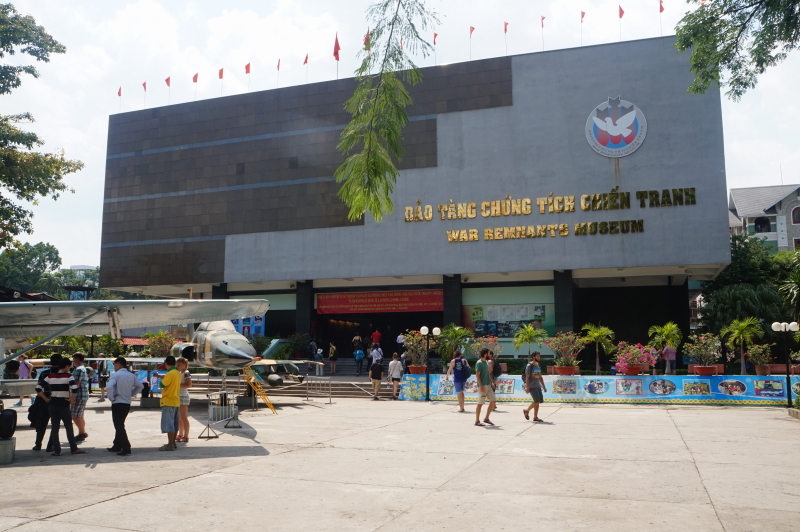 We then headed off to the War Remnants Museum. This was a grim outing, as the museum pulls no punches when it comes to showing the devastating impact of the ‘American’ war, as it is known here. One floor was full of photographs showing the atrocities committed by the United States, including images of the My Lai massacre. Another section was devoted to Agent Orange and the horrific impact that it had (and continues to have) on people exposed to it and their descendents. This was our introduction to the war and I found myself wanting to learn more. As such, we later bought the book When Heaven and Earth Changed Places, a gripping true-life tale written by a Vietnamese woman who amazingly lived through, and survived the horrors of the war. 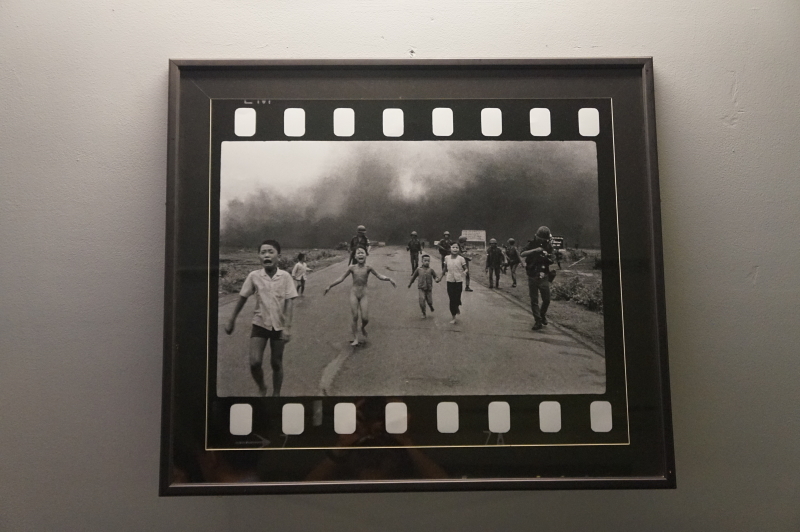 The iconic photo of nine year old Kim Phuc running from a napalm attack. Phuc, who now lives in Toronto, has a foundation to provide medical and psychological assistance to children in conflict zones. 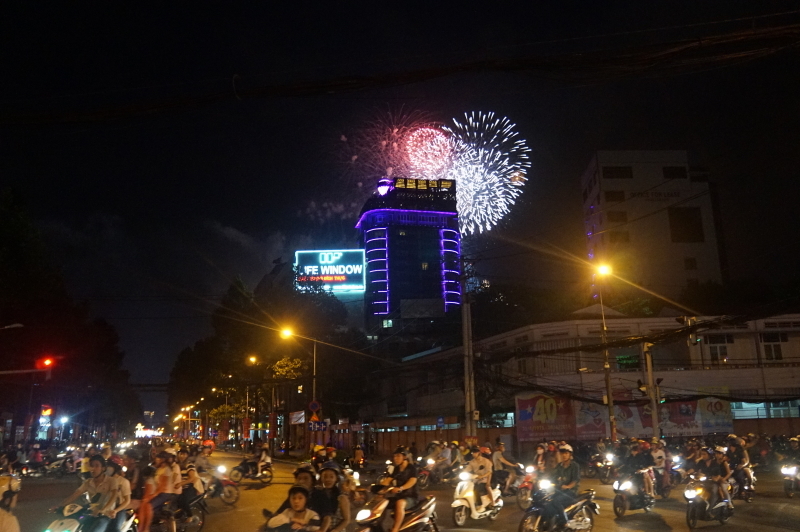 There was a firework show that evening; we managed to find a little space among the hordes and gazed upwards at the sky in anticipation. While our view was blocked somewhat, it nevertheless was a great spectacle. Chris here: What are the odds that the people sitting at the next table in a tiny pho restaurant in Saigon are part of the same Facebook group you belong to? Quite high, it turns out. The only other Westerners on the second floor of the restaurant was a British family with two younger children. Conversation ensued and it turned out that they also belong to the wonderful Families on the Move Facebook group. 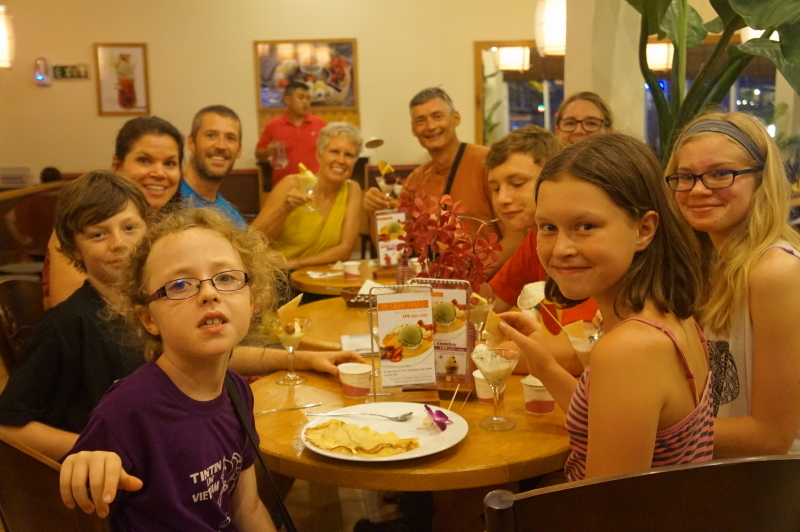 Over the next several days, we met a second family from Michigan, shared several meals and a walking tour, and went on a hunt for the perfect ice cream with them. 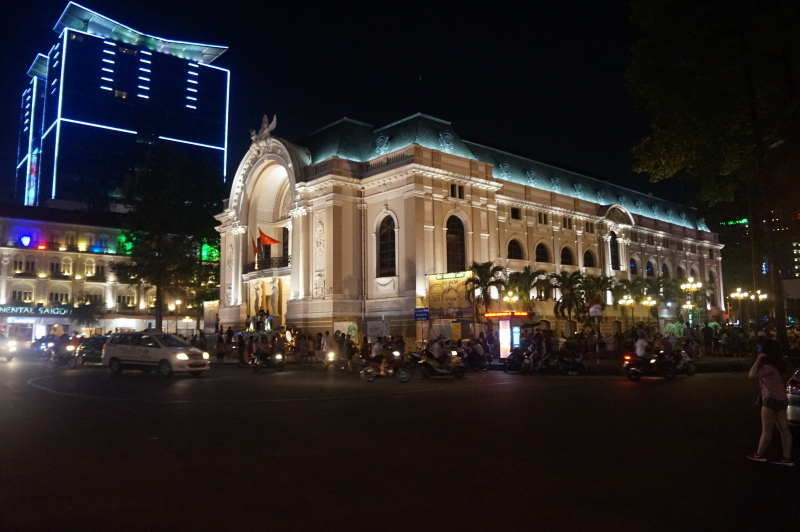 Back to Nancy: On our last evening, Chris and I decided to splurge and picked up some tickets for a performance at the Saigon Opera House called À Ố. Built in 1897 by a French architect, the façade of the building resembles the Petit Palais in Paris which was built at the same time. As such, we all felt that we had been transported back to Paris as we strolled up the steps and entered this beautiful building. 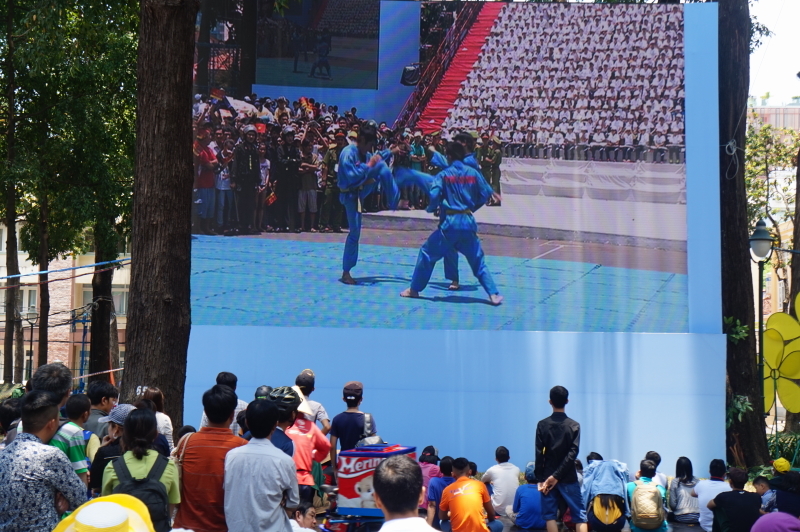 The show was quite exceptional; it was an acrobatic show in which the only props used were bamboo baskets and poles. 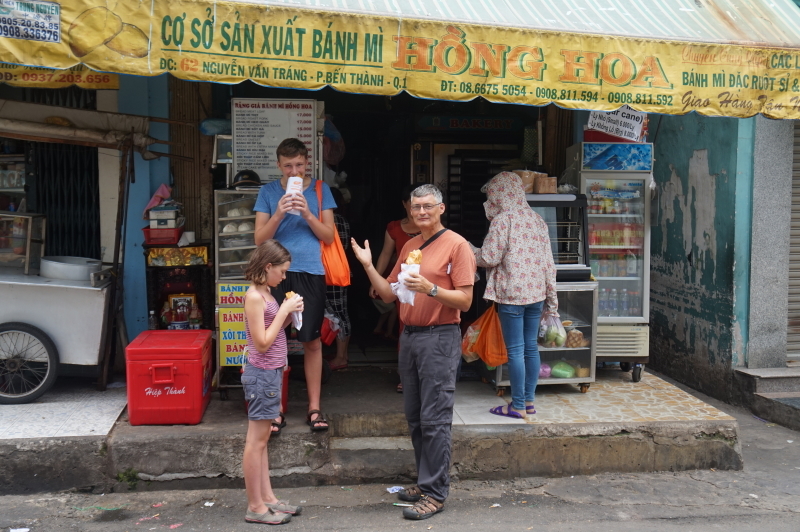 During our stay, Chris organized a Jane’s Walk for us, which will be a separate post, and we spent many hours strolling the streets taking in the sights and tastes. 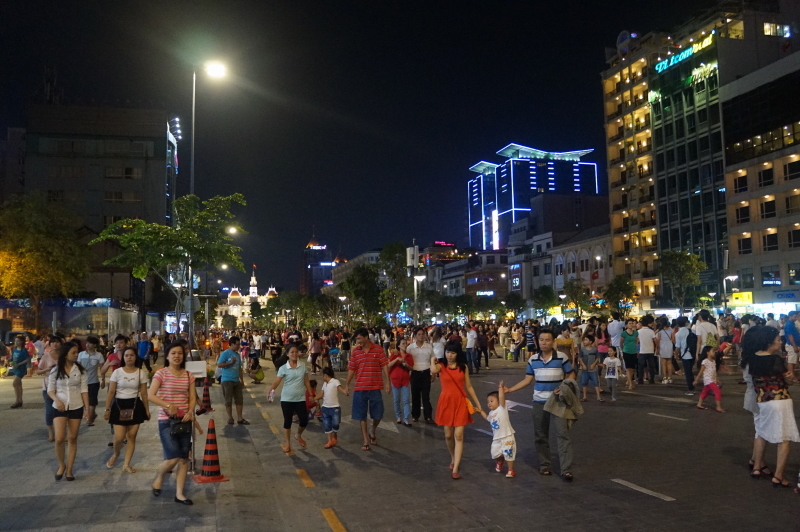 All in all, Ho Chi Minh City was a fantastic start to our adventures in Vietnam. 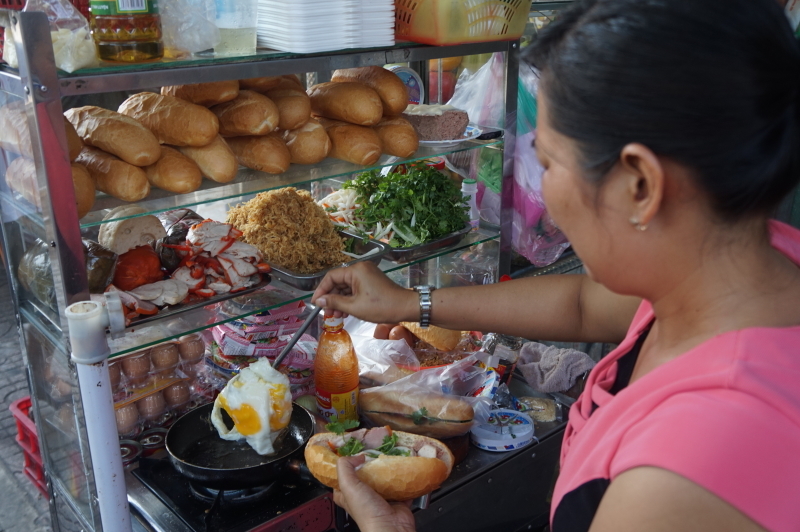 …and finding some of the tastiest sandwiches at a street stall by our guesthouse. …and a wonderful street promenade. Amazing stories and perspectives. Thank you Winter-Palardy family for sharing. It feels like I’m there with you.